Every year as the blue expanse of May sky stretches out above my head and new life begins to overtake the chill of winter with a blanket of green, I think of my mother. Like the tender leaves that appear each Spring, she was soft and delicate by nature, but she fought with stubborn determination to live. She fought to see May skies and to run barefoot catching lightning bugs on warm June nights. She fought to watch basketball games and swim meets and school plays. She fought to sing bedtime lullabies and make Saturday morning doughnuts. She fought to celebrate birthdays with her famous chocolate cake and see school years come to an end. She fought to see the trees blossom and the leaves fall. Her last May, as the trees pulled on their Summer blooms like party dresses and the grass grew long and green, she grew too weak to tend and nurture as she always had. Instead, she fought for each and every breath that filled her lungs. That May, I counted the days with desperation until I could point my car south and not stop driving until it pulled into our old asphalt driveway. When I got home, I found her standing in our kitchen, her feet firmly planted against the parquet floor that had held the rhythm of her footsteps for so many years as she padded from the oven to the stovetop to the large ceramic sink. The corners of her mouth spread into a smile and I gently wrapped my arms around her tiny frame, pressed my cheek to the the side of her downy face and breathed in the scent of her skin and her perfume. The next morning I set our old wooden farm table with her mother’s China and filled a cut glass pitcher with hydrangeas from her garden trying to recreate the beauty that she so brought so effortlessly to our home. I zested lemons to make her special blueberry muffins and then our little family sat down together and celebrated Mother’s Day. That was the last meal she ate at the table she had set and filled every night of my childhood with a home cooked meal, the table where she listened to the mundane details of my day and laughed at my father’s jokes, the table where we celebrated birthday dinners and gave thanks for our blessings. 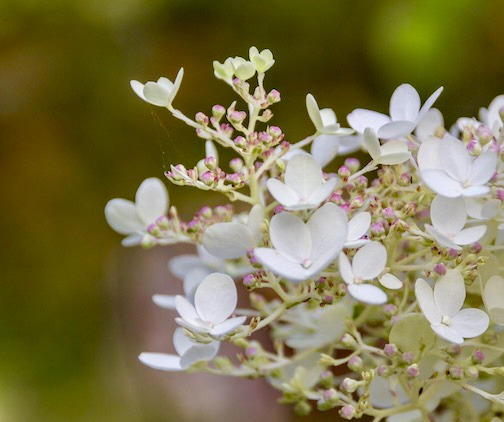 The next morning she couldn’t muster up the strength to pull herself out of bed and into the chair that overlooked her garden, so my dad took her old green garden shears and clipped a bouquet of roses and hydrangeas to put by her bedside. Over the next span of days, her fight for breath grew harder, until I curled up beside her like she had every night of my childhood and told her that she didn’t need to fight any more, that we’d be ok.
A few days later, on a perfect sunny May afternoon, my sweet mom finally stopped fighting. In a room surrounded by her dearest friends with the sound of their voices choking out a melody of praise she closed her eyes and woke up in the arms of Christ. So every May, as tender green leaves begin to unfold, I remember my mom. I remember her as I tend the earth and prune back branches. I remember her as I dig and transplant. I remember her as I fill vases with hydrangea blooms and set them on her old wooden farm table. I remember her as I teach my children how to garden as she taught me. And with each new sign of life, I rejoice knowing I will see her again.